Let’s say you own the local flower shop in the beautiful town of Pawnee, Indiana and just 20 minutes away from your shop is the equally beautiful town of Eagleton. Some of your customers come from Eagleton. For your SEO strategy, you would like to rank for both towns. Google uses “NAP” (name, address, phone number) listings to determine organic search rankings, meaning that the name, address, and phone number are expected to be an exact match across the internet. When those don’t match, the likelihood of ranking organically outside of your physical location becomes a challenge. Google will usually rank a competitor with a matching physical location higher than you. Google will rank the flower shop in Eagleton higher than your Pawnee shop. Enter Pay Per Click. By targeting city centric keywords, you can reach your desired clientele. For example, by adding the keyword “red roses Eagleton” to your PPC campaign you can ensure your ad will be triggered by someone searching for red roses in Eagleton. More importantly, by setting up your location targeting for both Pawnee and Eagleton, your ads will show up for someone searching in Eagleton, even if the search is just “red roses” with no corresponding location keyword. Combining local SEO is an important step that cannot be missed, but when using it in tandem with PPC, you’ll be sure to reach all potential customers. This isn’t a new idea, and it is something traditional media has embraced. Brands and other services use a combination of radio, TV, magazines, and print ads to reach their audience. They recognize that each of these channels have their own set of users. Search Engine Marketing relies on many third-party platforms: Bing, Adwords, Facebook Ads, Twitter, the almighty Google and others. While these avenues offer effective ways to reach customers, these platforms are also companies themselves. They make changes that can have a big effect on the way you’re conducting business on that platform. On June 29, 2016, Facebook announced another update to its algorithm for the newsfeed. While businesses’ organic reach has been steadily declining for years, this move made newsfeeds more friend/family focused, decidedly reducing the amount posts by organizations. If your main source of business had been from organic Facebook posts, this change would dramatically affect your business. 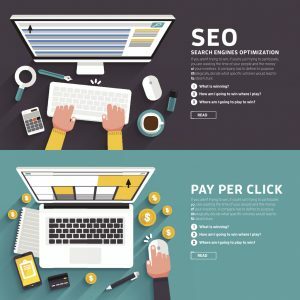 Using a combination approach of PPC and SEO means you’re not dependent on one marketing channel. If you were already using Facebook ads in tandem with your organic posts, then your company can weather changes more easily. About two years ago, Google encrypted all searches and as a result, this cut off all keyword level data in Google Analytics, limiting the keyword insights people could get on their websites. You could no longer see which keywords brought in users and eventual conversions. Since keywords still play an integral part in SEO strategy, marketers have to use other strategies to gain insight. By using a PPC platform, you can inform your organic strategy. Keywords are also critical to PPC and are the foundation for PPC campaigns. 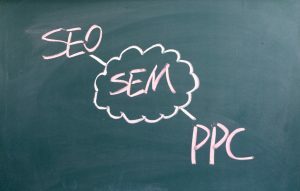 With PPC, you have insights into keywords and which have a high click-through-rate and convert. You can even regain your keyword level insights in Analytics again by hooking Analytics to your Adwords account. Beyond just informing your SEO strategy, PPC can target keywords that aren’t ranking organically. Ad copy is another tool that can inform your SEO strategy. Metadata is a crucial part of SEO and in Adwords you can test calls to action, ad copy, and keywords. By selecting the ones with the highest click-through-rate, you can more effectively prioritize the keywords and language for your metadata. With PPC, you want to focus on people who will perform a call to action (i.e. filling out a form, calling your business, setting up an appointment, purchasing an item etc.) You don’t want people in the research phase clicking and spending money on your ad if they aren’t ready to perform one of those actions. In fact, we regularly add interrogative pronouns as negative keywords to our PPC campaigns. Using SEO, you can target those keywords. You want people in the research phase to come to your site. About 81 percent of consumers research a product before buying it. They do this through search engines, by reading reviews, reading product information, and visiting multiple online stores. By targeting multiple parts of the funnel, you increase the likelihood of generating an action out of a user. Generally speaking, SEO is your long game. You research competition and build high authority and relevant. Increase local citation links for local organic traffic and positions. Ensure that the most relevant and high-traffic keywords are used in the meta data and that the meta information is indexed with the search engines. You build relevant citation links. This isn’t work you can do once and then call it quits, especially if you want to rank well and for different terms. In the short-term, PPC can be used to jumpstart your site and business. You build out a campaign and you’re off to the races within hours. You can set up multiple a/b tests, and as we mentioned before, use these insights to improve your SEO. In February 2016, Google did away with the paid ads on the right-hand side of the search results, revamping the Search Engine Result Pages- known as SERP’s (so paid ads now own the top four spots (and the bottom four). This change rippled through the Search Engine Marketing industry as we all held our collective breath. Turns out that cost-per-click and organic remained largely the same, but the emphasis on the top real estate grew. Even on something you think you own completely, like your brand, you’re going to have competition. It’s common practice in PPC to pay for your competitors’ brand terms since these keywords tend to be cheaper. Having a competitor campaign in your PPC account means you have the chance to potentially convert a customer and expand your reach by tapping into a “look alike” audience. This works both ways. Your brand is also valuable and competitors will be bidding on your terms as well. At the very least, adding brand keywords acts as insurance that your ads will be visible, even in the face of competition. Using PPC and organic together, you can dominate the top part of the search results to ensure maximum exposure for your products or services.